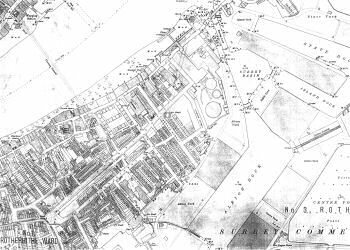 This map shows the mature residential and industrial landscape of Rotherhithe. 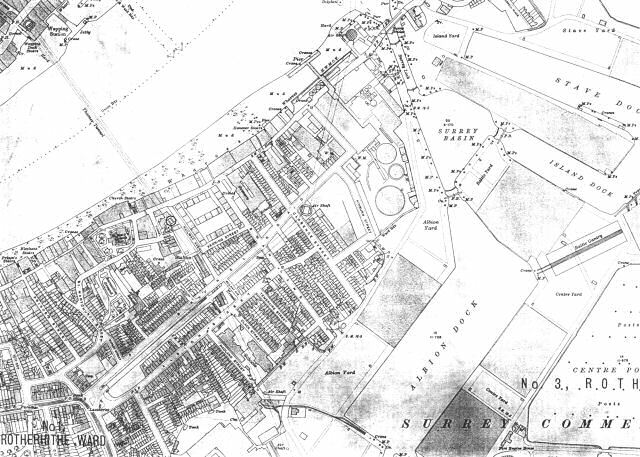 Industry and commerce is represented by the ponds and yards of the Surrey Commercial Docks; the Metropolitan Gas Works in Brunel Road; many riverside wharves and part of Brandram's chemical works. Most residences are terraces with rear additions, but there are tenements at Railway Avenue. There are also two tunnels, Brunel's Thames Tunnel and the Rotherhithe (road) Tunnel, both of which are still in use. Copy print showing part of the Ordnance Survey of London,Sheet V.16 and Sheet 78.